Chevrolet understands the history its models hold with customers and long-time Chevrolet owners, so it seems only natural that they decided to bring back one of their more loved products, the Blazer, just in time to celebrate the models 50th Anniversary on the road. The original Chevrolet Blazer was definitely more of a truck with a larger engine and a decidedly rougher ride, however, this all-new version is a crossover with a unibody structure and a smaller engine. Positioned between the Equinox and the Traverse, the 2019 Chevrolet Blazer is set to be the ideal 2-row crossover for modern urbanite families. With a decidedly daring design, the 2019 Chevy Blazer is the most modern-looking in the current lineup of six SUVs and crossovers at Chevy. The front end is instantly recognizable as being lifted directly from the crossover’s sportier performance cousin, the Camaro. And it wears it well. The 2019 Chevy Blazer is loaded with character and personality. Inside the 2019 Chevrolet Blazer, you’ll notice that this new crossover shares amenities and a design layout with the Acadia. The 2019 Chevrolet Blazer boasts six USB ports, a wireless charging pad, electronically operated glove-box, trailer-guide system, and the usual lane-keep and blind-spot monitoring you’ve come to expect on all modern SUVs and crossovers. When the 2019 Blazer becomes available, there will be two engines to choose from: a standard 2.5L inline-4 will produce 193 horsepower, as well as a more powerful 3.6L V6 that will be good for 305 ponies. Both engines will be paired with Chevy’s 9-speed automatic and will come standard with AWD. 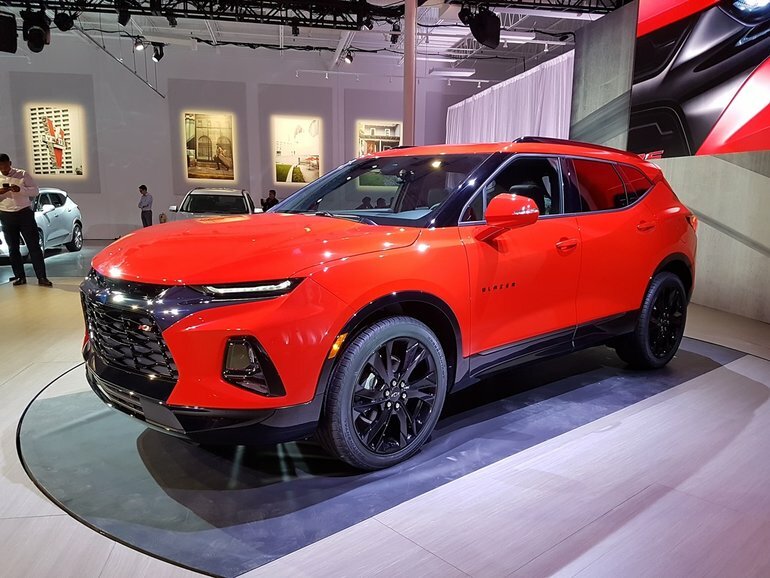 The all-new 2019 Chevrolet Blazer won’t arrive in dealers until early 2019, but you can definitely still find out more about this super cool crossover from Chevrolet by heading down to your local Surgenor Barrhaven Chevrolet dealer to speak to one of our experts about everything the new Chevy Blazer will have to offer. And you can make sure you sign up for a test drive when the vehicle finally arrives in a few months.